I have got into the habit of making flapjacks on a Sunday night for the week – though they don’t always last that long. I have taken to storing them in the car so I am not tempted – there is evidence that unsurprisingly shows that if you can see food you eat it! 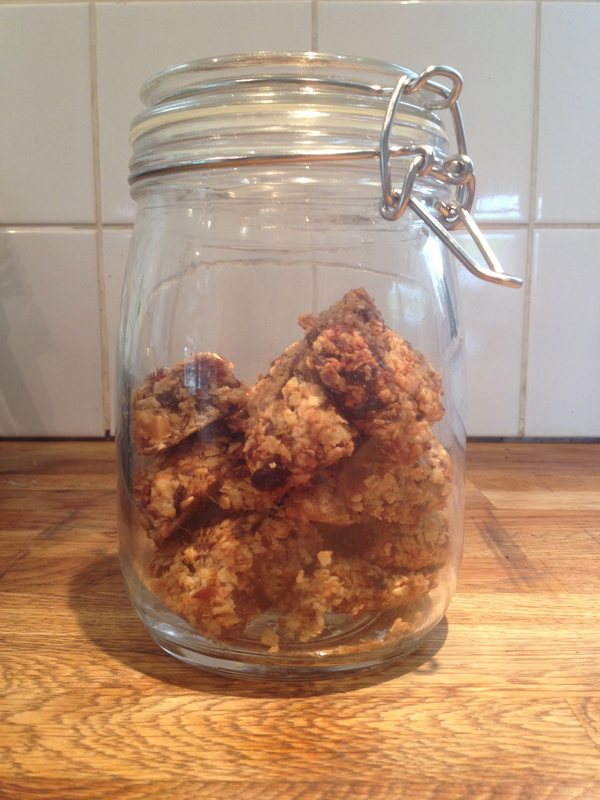 This is the first time I’ve made them with no honey, just relying on natural sugars from dates and bananas. There is a lot in the media and books to buy, and recipes online for no sugar foods. Which is great. We are still waiting to hear following on from the draft guidance on sugar intakes published by the Government’s SACN. In the meantime World Health Organization has published their latest recommendations to reduce intakes to 10% with an ideal target of 5% or less. It’s worth remembering that honey, maple syrup, dried fruit and smoothies still contain sugar but because the sugar is in it’s natural form it also provides nutrients. So recipes that contain these natural forms of sugar are not “sugar free” but have no “refined sugar” or “processed sugar” or, I suppose “added sugar”. Refined sugar is has no vitamins or minerals, so really only provides empty calories. The sugar in honey, maple syrup etc, is in its natural form, so it has a lower GI (a slower release of sugars into the blood) and also contains some minerals. Maple syrup is high in manganese, and contains good amounts of zinc and potassium. Honey contains very low levels of iron, copper and manganese. These flapjacks are perfect for picnics and after main meals. Not recommended for between meals as the sticky sugars can get stuck on teeth. Regularly eating dried fruit, juices or smoothies between meals increases risk of dental decay. See my previous post, Sweet Tooth for more information. This recipe is vegan if you use coconut oil, if you use butter best to use organic. Organic Standards legally set mean that organic cattle have to be pasture fed for the most of the year. Flapjacks are really easy and quick to make, your children can help with the mashing and mixing (my 2 year old happily helps out – it gets messy and keeps her busy). Mash the bananas on a plate. Add the coconut oil and dates and mix well. Now add the oats and desiccated coconut and again mix. Bake in an oven at 170 °C or 150 °C in a fan oven or gas mark 3 for 25 minutes. Cut into slices whilst still warm. If you have older children do not mention these flapjacks have no refined sugar in them as they will immediately hate them. My 8 year old had these happily last night because I said nothing! Great idea to have no sugar. My mother used to make rock cakes with lots of dried fruit and no sugar and I wolfed them down. Not so great at doing it myself though as I have a bit of a sweet tooth! Was going to stumble but couldn’t find a button. Choclette – thanks for your comment – I have a sweet tooth too and this is my way of addressing it! The whole challenge of developing / trying recipes where sugar is reduced or just in natural form really is the area I want to get into – but time is an issue with a 2 year old and 8 year old 🙂 … love your recipes too and am now following your blog. have now install the stumble upon button – don’t worry about clicking it just need to get up to speed on all things blogging again.